" ...it is always advisable to perceive clearly our ignorance." Biodiversity crisis is deepening, in spite of the international efforts, therefore there is an increasing need for the better understanding of nature via ecological research. Our research group intends to harmonize efforts towards the functional aspects, and to integrate the theoretically sound and applicable ecological researches. The study of taxon-abundance relationships, diversity, similarity, parasite and other animal assemblages are in our focus of interest, together with the development and application of suitable quantitative methods using advanced techniques (both software and laboratory, e.g. molecular and bioacoustical techniques), complemented by field experiments and surveys. Our strategy is to apply methods from other disciplines for our researches. One of our main priority is to develop the scientific base for nature conservation, including the analysis of biodiversity on farmlands vs. natural habitats, seeking for keystone species and assessing the sensitivity of food webs. We intend to further develop our researches on population biology, co-evolution and epidemiology of animal parasites. Report of a highlighted research topic of the Group is available here (in Hungarian). Bat�ry, P., B�ldi, A., Kleijn, D. and Tscharntke, T. (2011) Landscape-moderated biodiversity effects of agri-environmental management - a meta-analysis. Proceedings of the Royal Society B-Biological Sciences, in press. Kov�cs-Hosty�nszki, A., Bat�ry, P., B�ldi, A. and Harnos, A. Interaction of local and landscape features in the conservation of Hungarian arable weed diversity. Applied Vegetation Science, in press. Kov�cs-Hosty�nszki, A., Bat�ry, P. and B�ldi, A. Local and landscape scale effects on bee communities of Hungarian winter cereal fields. Agricultural and Forest Entomology, in press. Bat�ry, P., B�ldi, A., S�rospataki, M., Kohler, F., Verhulst, J., Knop, E., Herzog, F. and Kleijn, D. 2010. Bees and insect-pollinated grassland plant communities in three European countries. Agriculture, Ecosystems & Environment 136: 35-39. Horv�th, M., Szitta, T., Firm�nszky, G., Solti, B., Kov�cs, A. and Mosk�t, C. (2010) Spatial variation in prey composition and its possible effect on reproductive success in an expanding Eastern imperial eagle (Aquila heliaca) population. Acta Zoologica Academiae Scientiarum Hungaricae 56: 187-200. B�ldi, A., T�thm�r�sz, B., Kov�cs, A. �s Lerner, Z. (szerk.) 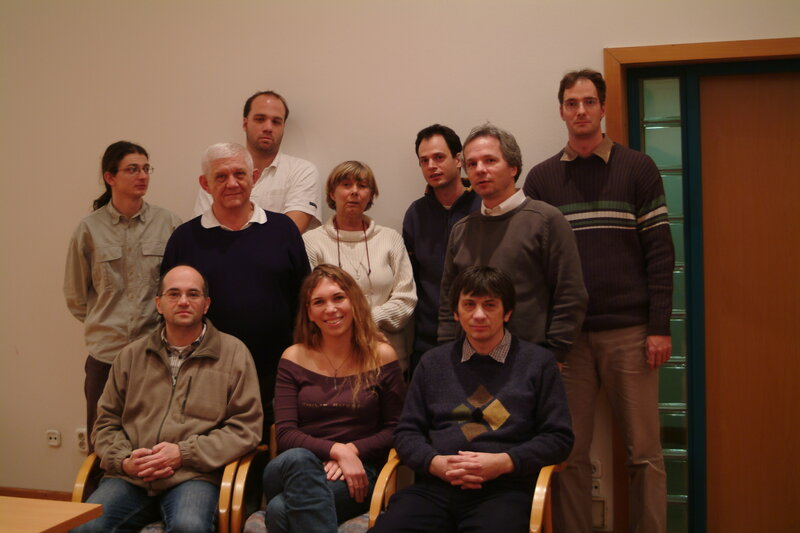 (2009) Az V. Magyar Term�szetv�delmi Biol�giai Konferencia k�tete, Ny�regyh�za, 2008. november 6-9. Term�szetv�delmi K�zlem�nyek 15: 1-540. Kleijn, D., Kohler, F., B�ldi, A., Bat�ry, P., Concepci�n, E.D., Clough, Y., D�az, M., Gabriel, D., Holzschuh, A., Knop, E., Kov�cs, A., Marshall, E.J.P., Tscharntke, T. and Verhulst, J. (2009) On the relationship between farmland biodiversity and land-use intensity in Europe. Proceedings of the Royal Society B-Biological Sciences 276: 903-909. REVIEWED in: Science for Environment Policy, DG Environment News Alert Service, 15 January 2009. Igic, B., Hauber, M. E., Galbraith, J. A., Grim, T., Dearborn, D. C., Brennan, P. L. R., Mosk�t, C., Choudhary, P. K. and Cassey, P. (2010) Comparison of micrometer- and scanning electron microscope-based measurements of avian eggshell thickness. Journal of Field Ornithology 81: 402-410. Mosk�t, C., B�n, M., Sz�kely, T., Komdeur, J., Lucassen, R. W. G., van Boheemen, A. L. and Hauber, M. E. (2010) Discordancy or template-based recognition? Dissecting the cognitive basis of the rejection of foreign eggs in hosts of avian brood parasites. Journal of Experimental Biology 213: 1976-1983. Mosk�t, C. and Hauber, M.E. (2010) Chick loss from mixed broods reflects severe nestmate competition between an evictor brood parasite and its hosts. Behavioural Processes 83: 311-314. Hargitai, R., Mosk�t, C., B�n, M., Gil, D., L�pez-Rull, I. and Solymos, E. (2010) Eggshell characteristics and yolk composition in the common cuckoo Cuculus canorus: are they adapted to brood parasitism? Journal of Avian Biology 41: 177-185. Takasu, F., Mosk�t, C., Munoz, A.R., Imanishi, S. and Nakamura, H. (2009) Adaptations in the common cuckoo (Cuculus canorus) to host eggs in a multiple-hosts system of brood parasitism. Biological Journal of the Linnean Society 98: 291-300. Mosk�t, C., Hauber. M. E., Avil�s, J. M., B�n, M., Hargitai, R., Honza, M. (2009) Increased host tolerance of multiple cuckoo eggs leads to higher fledging success of the brood parasite. Animal Behaviour 77 1281�1290. Avil�s, J.M., Mosk�t, C., B�n, M., Hargitai, R., Parejo, D. (2009) Common cuckoos (Cuculus canorus) do not rely on indicators of parental abilities when searching for host nests: the importance of host defences. Auk 126: 431�438. Orci, K. M., Sz�v�nyi, G. and Nagy, B. (2010) A characterisation of the pair-forming acoustic signals of Isophya harzi (Orthoptera, Tettigonioidea, Phaneropteridae). Acta Zoologica Academiae Scientiarum Hungaricae 56(1): 43-53. Orci, K. M., Sz�v�nyi, G. and Nagy, B. (2010) Isophya sicula sp. n. (Orthoptera: Tettigonioidea), a new, morphologically cryptic bush-cricket species from the Eastern Carpathians (Romania) recognized from its peculiar male calling song. Zootaxa 2627: 57-68. Orci, K. M., Sz�cs, G. (2009) Ultrasonic and sonic emission during the courtship behaviour in males of Z- and E-pheromon strains of the european corn borer, Ostrinia nubilalis H�bner (Lepidoptera, Pyraustidae). Bioacoustics 19: 93-107. Orci, K. M. (2007) Female preferences for male song characters in the Bush-cricket Isophya camptoxypha (Orthoptera, Tettigonioidea, Phaneropteridae). Journal of Insect Behavior 20(5): 503-513. Scotti, M. and Jord�n, F. (2010) Relationships between centrality indices and trophic positions in food webs. Community Ecology 11:59-67. Bauer, B., Jord�n, F. and Podani, J. (2010) Node centrality indices in food webs: rank orders versus distributions. Ecological Complexity 7: 471-477. Liu, W., Chen, H-W., Jord�n, F., Lin, W-H. and Liu, W-J. Quantifying the interaction structure and the topological importance of species in food webs: a signed digraph approach. Journal of Theoretical Biology, in press. Jord�n, F. Maintaining connectivity: topological considerations on landscape digraphs. In: Liu, J. et al. (Eds. ): Sources, Sinks, and Sustainability across Landscapes, Cambridge University Press, Cambridge, in press. Livi, C.M., Jord�n, F., Lecca, P. and Okey, T.A. Identifying key species in ecosystems with stochastic sensitivity analysis. Ecological Modelling, in press. Jord�n, F. (2009) Keystone species and food webs. Philosophical Transactions of the Royal Society B 364: 1733-1741. Vasas, V., Magura, T., Jord�n, F. and T�thm�r�sz, B. (2009) Graph theory in action: evaluating planned highway tracks based on connectivity measures.Landscape Ecology 24: 581-586. Bhadra, A., Jord�n, F., Sumana, A., Deshpande, S. and Gadagkar, R. (2009) A comparative social network analysis of wasp colonies and classrooms: linking network structure to functioning. Ecological Complexity 6: 48-55. Møller, A.P., Erritzøe, J. and R�zsa, L. (2010) Ectoparasites, uropygial glands and hatching success in birds. Oecologia 163: 303-311. Vas, Z., Cs�rg�, T., Møller, A. P., R�zsa, L. (2008) The feather holes on the Barn Swallow Hirundo rustica and other small Passerines are probably caused by Brueelia spp. lice. Journal of Parasitology 94: 1438-1440. Apari, P., R�zsa, L. (2009) The tripartite immune conflict in placentals and a hypothesis on fetal-maternal microchimerism. Medical Hypotheses 72: 52-54. R�zsa, L. (2008) The rise of non-adaptive intelligence in humans under pathogen pressure. Medical Hypotheses 70: 685-690. Ujvari, B., Wallman, J.F., Madsen, T., Whelan, M. & Hulbert, A.J. (2009) Experimental studies of blowfly (Calliphora stygia) longevity: A little dietary fat is beneficial but too much is detrimental. Comparative Biochemistry and Physiology - Part A: Molecular & Integrative Physiology 154: 383�388. R�zsa, L. (2009) A psychochemical weapon considered by the Warsaw Pact: a research note. Substance Use & Misuse 44: 170-176. R�zsa, L. (2009) The motivation for biological aggression is an inherent and common aspect of the human behavioural repertoire. Medical Hypotheses 72: 217-219. Takasu, F. and Mosk�t, C. (2011) Modeling the consequence of increased host tolerance toward avian brood parasitism. Population Ecology 53: 187-193. Bat�ry, P., K�r�si, �., �rv�ssy, N., K�v�r, S. & Peregovits, L. (2009) Species-specific distribution of two sympatric Maculinea butterflies across different meadow edges. Journal of Insect Conservation 13: 223-230. K�r�si, �., �rv�ssy, N., Bat�ry, P., K�v�r, S. & Peregovits, L. (2008) Restricted within-habitat movement and time constrained egg-laying of female Maculinea rebeli butterflies. Oecologia 156: 455�465. Elek, Z., Dauffy-Richard, E. and Gosselin, F. (2010) Carabid species responses to hybrid poplar plantations in floodplains in France. Forest Ecology and Management 260: 1446-1455. Elek, Z. and T�thm�r�sz, B. (2010): Diversity and distribution of carabids along beech forest - grassland transects in Hungary. Community Ecology 11(2): 211-216. Elek, Z. and L�vei, G. (2007) Patterns in ground beetle (Coleoptera: Carabidae) assemblages along an urbanisation gradient in Denmark. Acta Oecologica 32. 104-111. Reiczigel, J., Lang, Z., R�zsa, L. & T�thm�r�sz, B. (2008) Measures of sociality: two different views of group size. Animal Behaviour 75: 715-721.